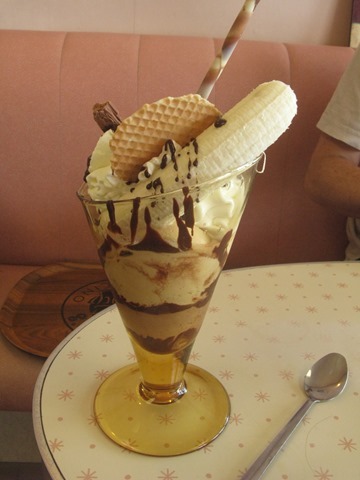 Some of you might know that I am a total whore for ice cream. I just went on holiday to Kent where one of my main objectives was to eat as much of it as possible. 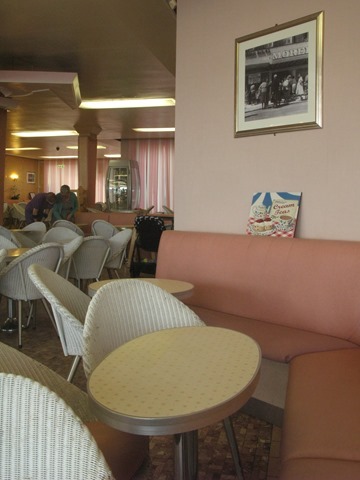 I had long dreamt of eating ice cream in an old chrome-countered seaside parlour, but until now had only caught tantalising glimpses of them on the cult website Classic Cafes and via ace food journalist Marina O’ Loughlin. 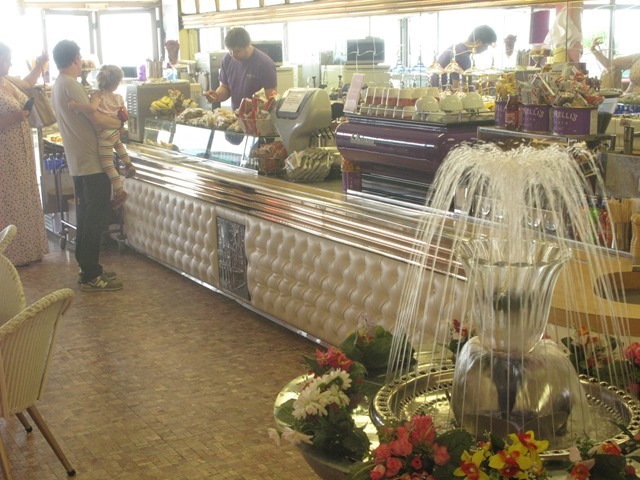 It wasn’t until a recent trip to the Kentish Coast that I experienced the charms of several of these parlours first hand. There are hardly any of them left, so it was such an insane treat to visit three in the space of one week. 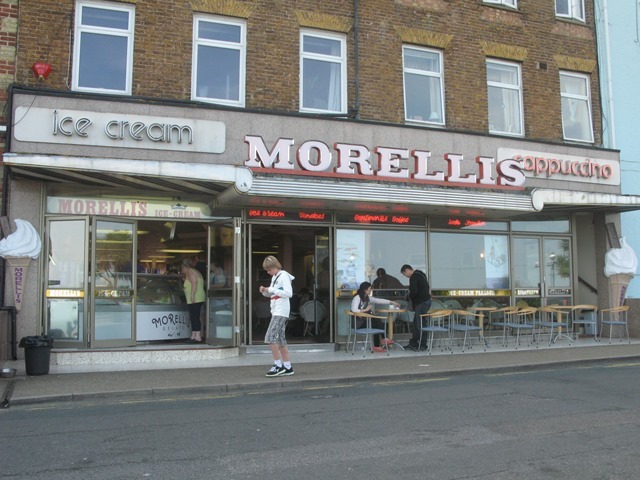 Morelli’s and Chiappini’s in Broadstairs, and Sorbetto of Ramsgate. It was a greedy vintage-lover’s idea of heaven! 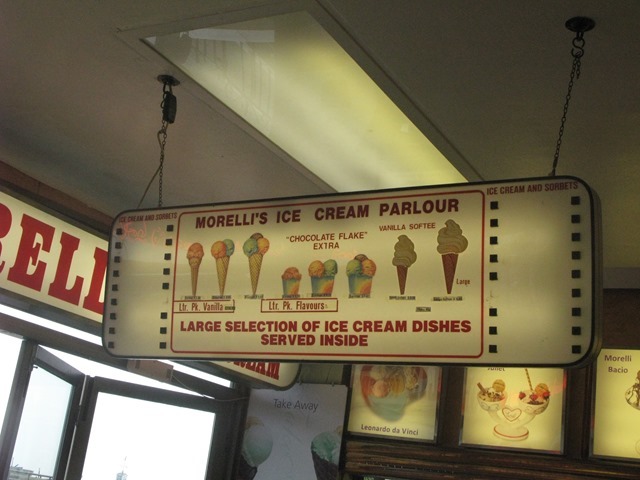 Morelli’s is something of an institution, not least for its delicious homemade gelato, but its lovingly preserved 1950’s interior. 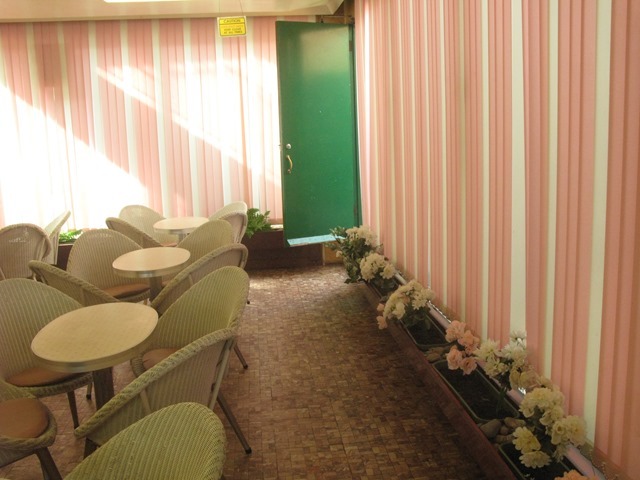 The shop frontage is all old shiny chrome flanked with big kitsch plastic ice cream cone statues, and inside you are transported into a world of sugared almond pink: the booths, the neon lights on the steps, the cushions on the white wicker Lloyd Loom chairs – all in pastel candy tones. 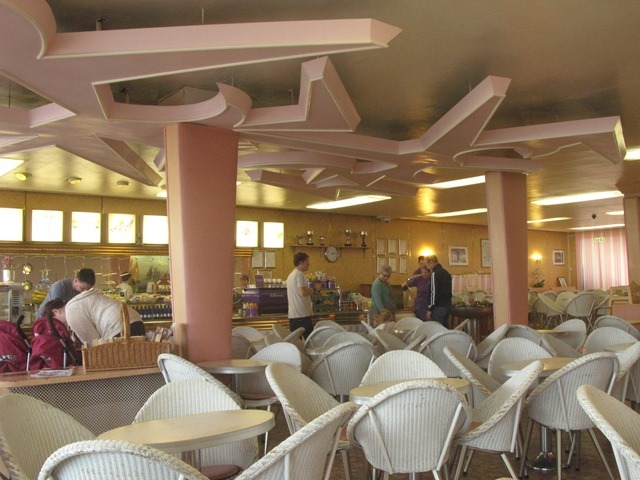 The ceiling is adorned with one of the most insane decorative reliefs I have ever encountered – how I’d imagine a Communist pattern dreamt in pale pink! 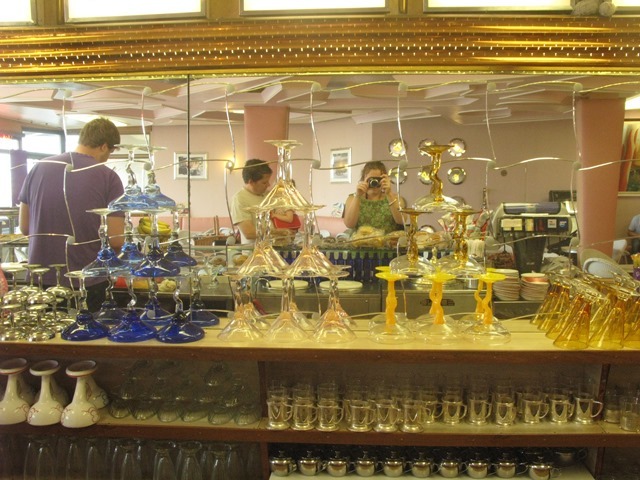 There is also a soda fountain, jukebox and beautiful 1950’s-style crockery: vivid-hued ornate glass sundae dishes and pretty cups and saucers. Silver seniors sipping milky coffee rub shoulders with coachloads of excitable foreign students. The atmosphere is very genteel. 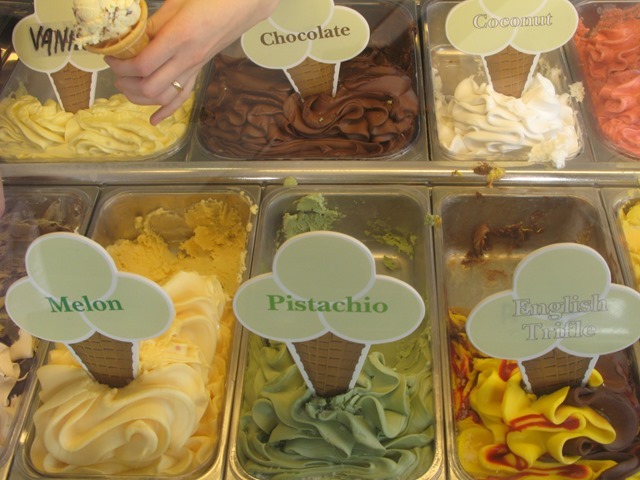 The gelato is pretty good, too. It’s a little thinner in texture than what I’m used to, as it’s not made with the traditional cream / egg-base. 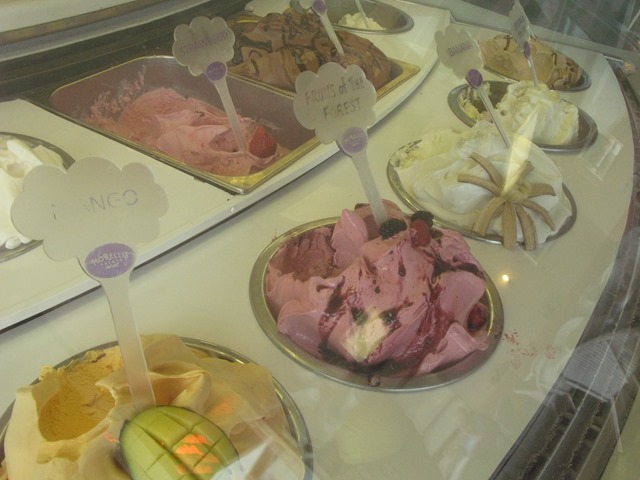 This Italian gelato is only made with milk which means you can eat MORE of it as it’s not so heavy on the digestion. The staff produce roughly 26 flavours in the downstairs kitchens on a daily basis, and on the day I visited they had around five specials. 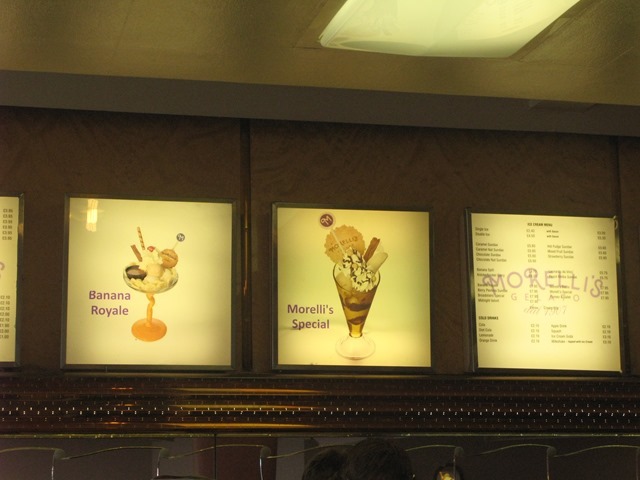 You can be a purist and just order plain scoops from the counter, however I was more interested in their sundaes menu. 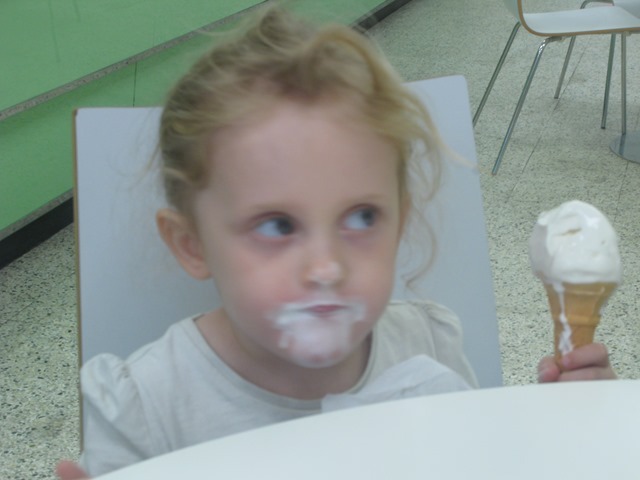 I wanted a big, camp ice cream experience, and I definitely got one. 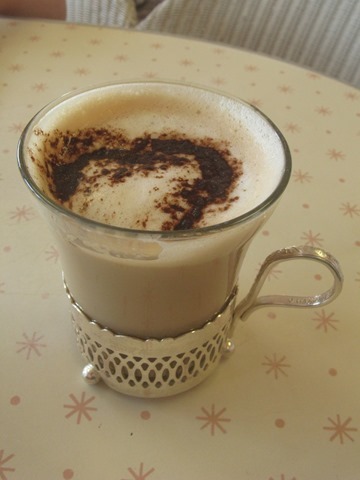 A very milky cappuccino, resplendent in its glass and silvery metal goblet – kitsch on toast, right? The coffee was fairly weak and uninspiring, though. 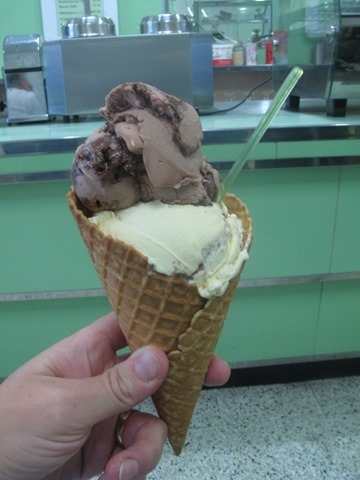 A day or two later, for the purposes of research, I returned for a double cone: black cherry and chocolate. I had actually pointed to the ‘raspberry ripple’ flavour to go with the chocolate, but mystifyingly got black cherry instead. Very 1970’s tasting. The chocolate wasn’t quite ‘chocolatey’ enough for me. But honestly, not too shabby – I wolfed it down. 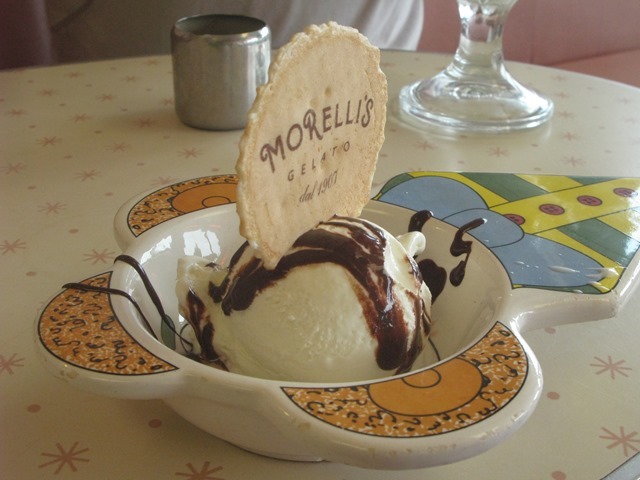 Morelli’s have ice cream parlours all over the globe, but the one in Broadstairs is the only one dripping in 1950’s history. I can’t believe all the furniture is the original 1950’s stock, it’s so brilliantly preserved. I want to come back again and again! 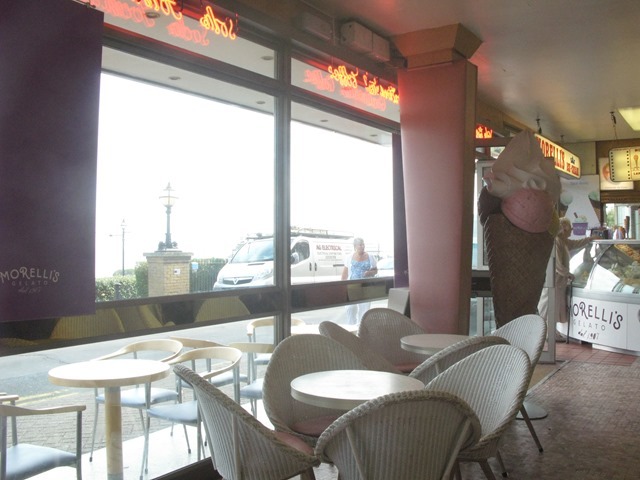 Those lucky folk in Broadstairs have another superb ice cream parlour just 100 metres down the seafront path from Morelli’s. 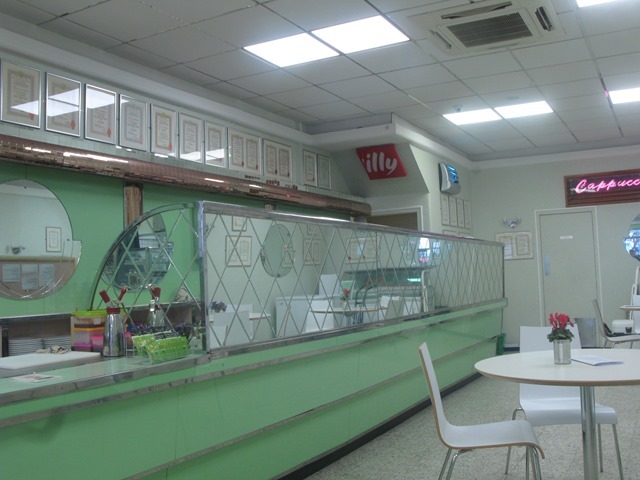 Although it opened in the 1950’s, it possesses a bit less of a wow factor when it comes to decor if you’re comparing to Morelli’s (hard not to), but the Italian family who run the place have lovingly preserved many of the fittings, so it still looks pretty darned cool anyway. 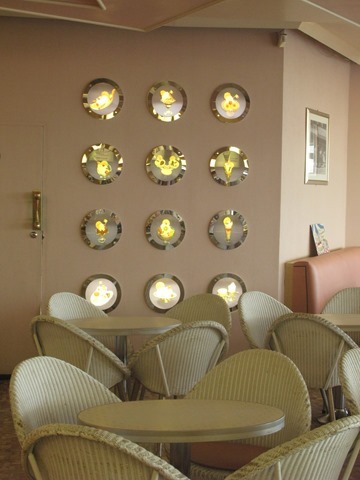 There is enough chrome in the interior fittings to keep me interested, and fabulous retro signage. 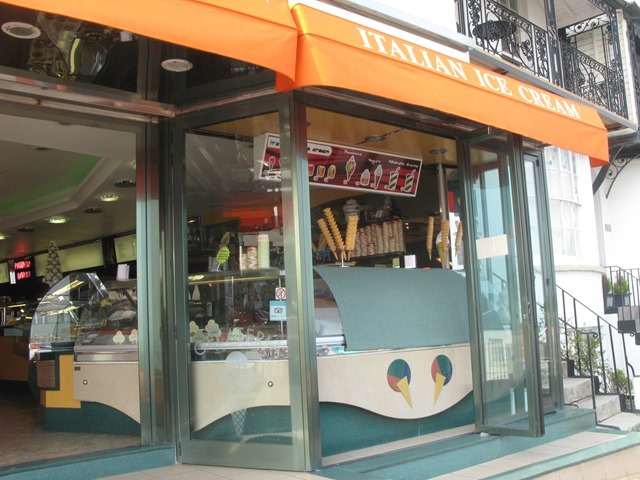 Most importantly, their gelato is OUT OF THIS WORLD – creamy, rich and clean tasting, winning hands down in my humble opinion, as it tastes decadent and satisfying, which ice cream always should. However, their coffee isn’t all that – burnt and rather bitter. Coconut gelato. 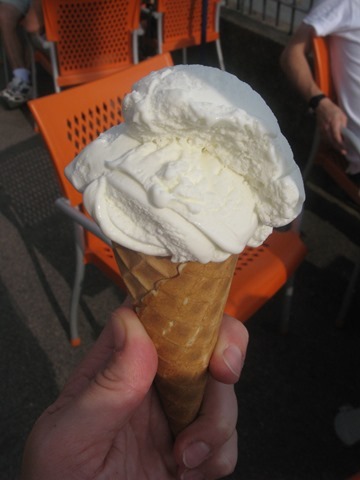 Just heaven in a cone. Not too sweet, rich and very coconutty. 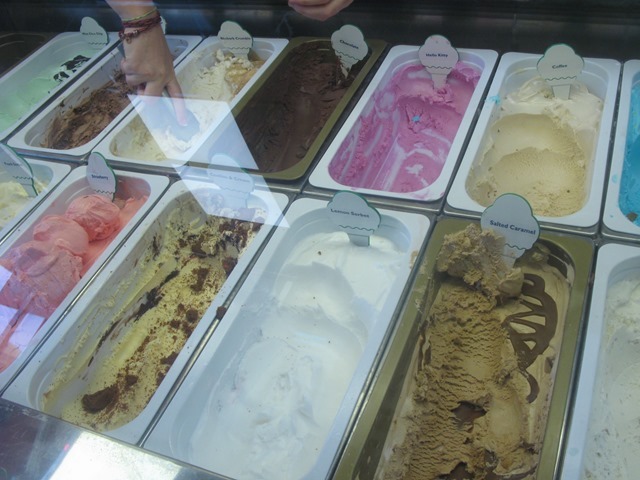 I think this was my favourite gelato of the whole holiday. I am dreaming of calling them up and asking them to FedEx me a few litres of it. 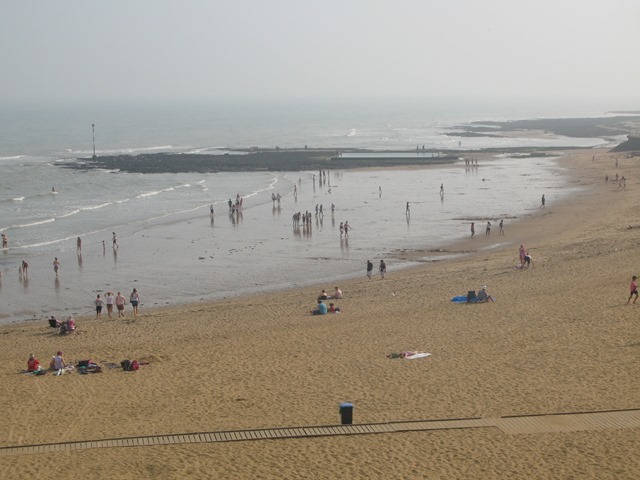 Ramsgate must be one of the least pretentious towns in Britain, with nary a hipster in sight. Grand Regency buildings rise up in a vertiginous swoop from a bustling harbour, with tatty edges galore. The beach has a forlorn, forgotten feel, flanked by mouldering derelict Regency buildings. 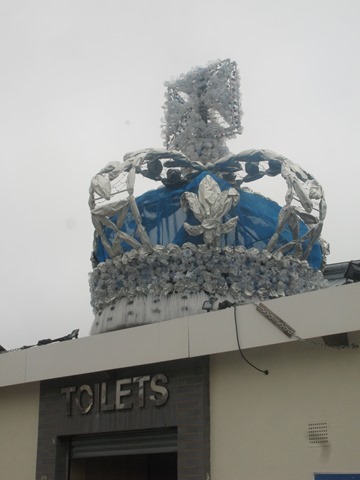 The day I visited, the roof of the harbourside public loos were decorated with a huge tinfoil and plastic crown to celebrate George IV’s links to this once-grand town. I bet he would have been thrilled! After being pestered by UKIP canvassers in the slightly moribund town centre (a profusion of scruffy chains and fruit n veg stalls) a treat awaited amid the strip of pubs and arcades on the seafront. 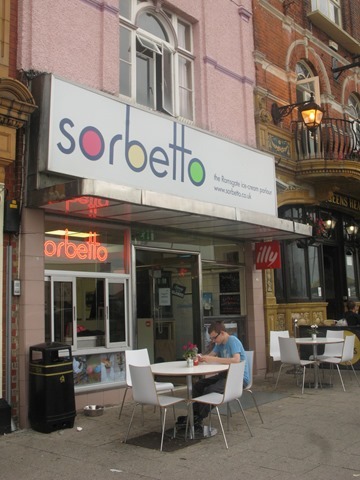 Sorbetto is the reincarnation of the previously Italian-run parlour called Pelosi’s; when the owner of the 70-year-old ice cream business retired, the chaps behind Sorbetto took ice cream-making lessons from him and reopened the parlour earlier this year. 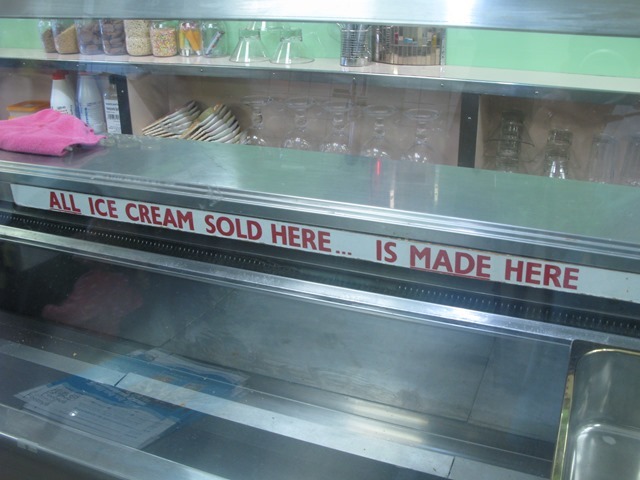 Their ice cream is to die for. It is stupendously effing good. 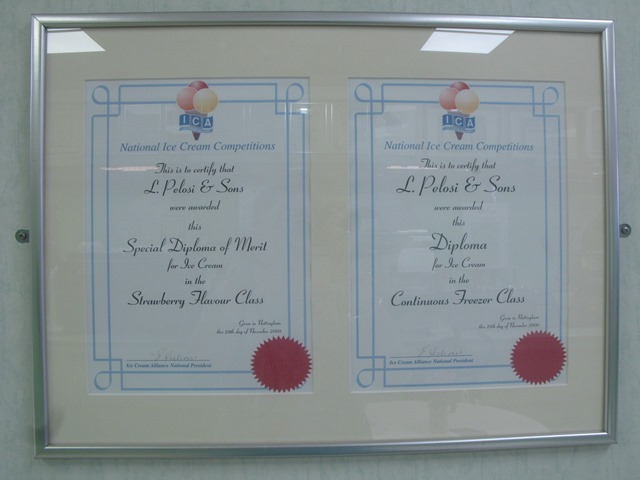 The new owners have thankfully preserved all the original decor and kept all the framed international ice cream awards certificates won by the Pelosi family on the walls. 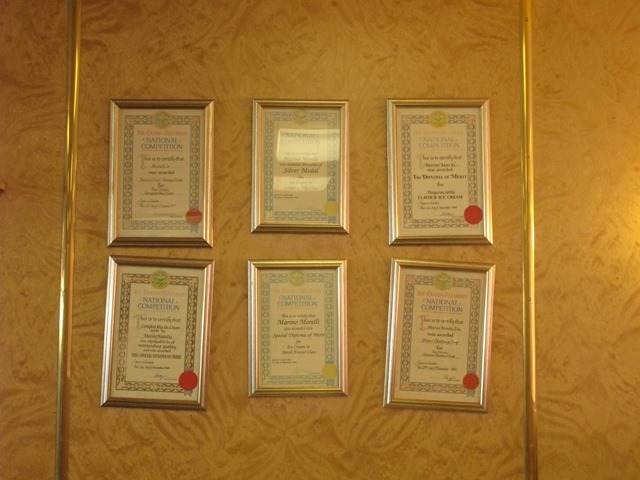 There are loads of these certificates, and judging by the high standards of ice cream in evidence now, it’s not surprising. 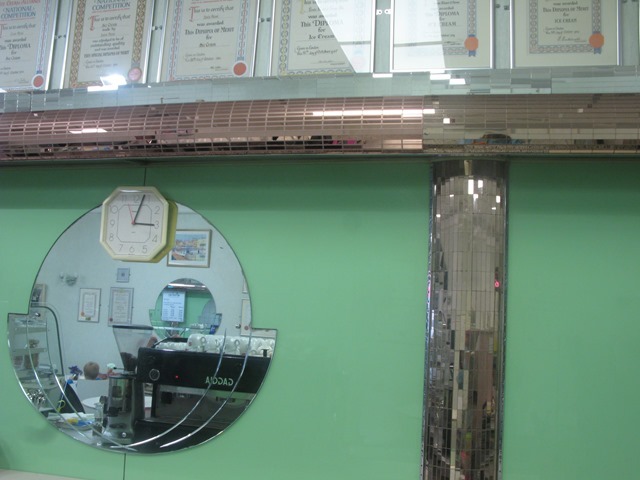 There are beautiful Art Deco-inspired mirrors, the counter is a vast pastel sweep of pistachio green, and the milkshake frothers look wonderfully ancient. Am just not too sure about the choice of white, Scandi-style tables and chairs, they don’t really fit with the surroundings. The fluorescent lighting is BLINDING. But not all modern touches are off kilter; there is a newly-installed beast of a churros hot doughnut machine sitting at the front of the shop. I’m sure that can only be a good thing. My husband scoffed down his rhubarb crumble gelato before I got a chance to take a proper picture: it had delicious chunks of crisp crumble topping and lumps of fresh tasting fruit. 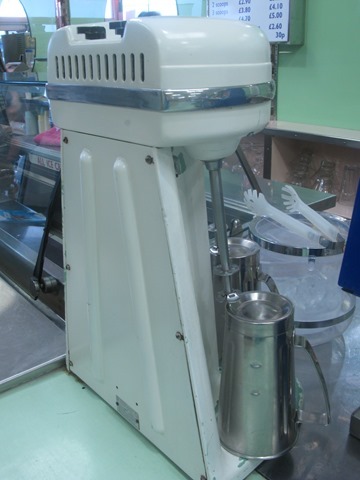 What I love about each of these ice cream parlours is that they’re all such one-offs, testament to the passion of the hardworking families that have been running them for decades, and offering their own signature creations. 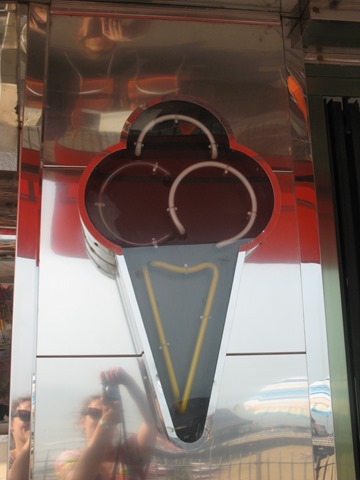 They make all their ice cream fresh every day, on the premises. They are the true antidote to the bland, soul-destroying chains that have destroyed the British high street. 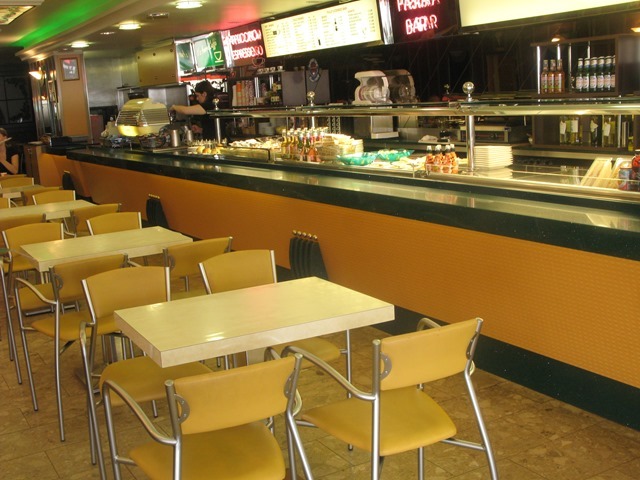 But we must keep visiting them to protect their futures – after all, who wants to eat boring old Ben & Jerry’s and Haagen Dazs mass-produced ices in identikit air-conditioned cafes when you could drop in for a freshly-made sundae amid twinkling chrome and pastel-coloured booths? I really didn’t think places like these existed anymore – let’s try and keep ’em alive! These are fabulous! 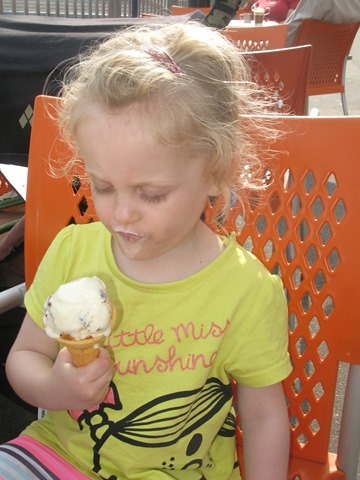 Love the photo of your small assistant licking the bowl, and I reckon you need some earrings like the vintage ice-cream signs at Chiappini’s. Oh yes – I could well do with some earrings like that, Pat Butcher would have nothing on me! 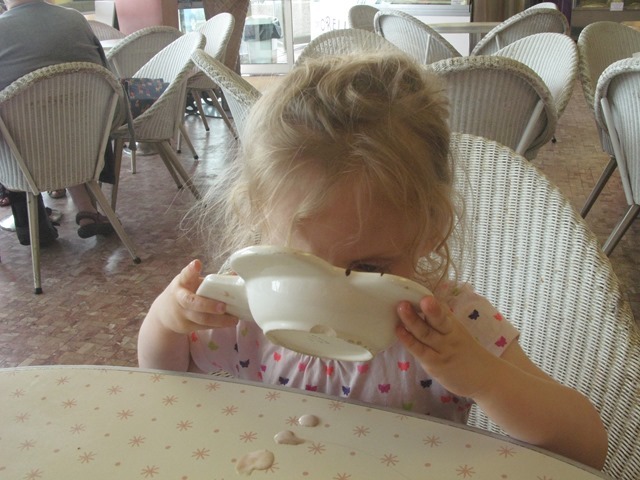 Did you try Makcaris on the sea front in Herne Bay? 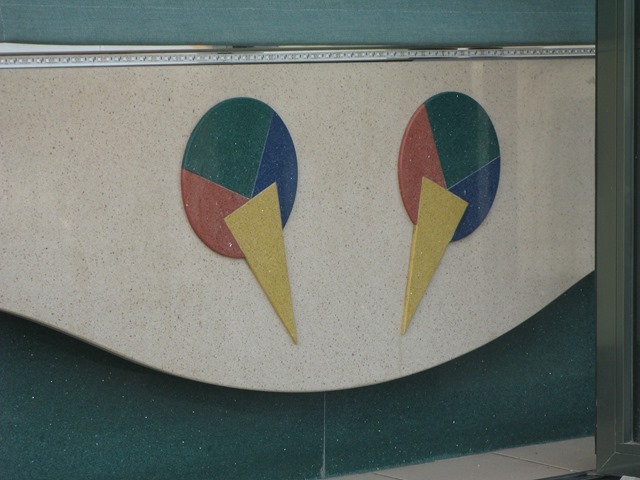 I don’t know what its like now or even if it’s still open but I used to take my children there in the 70’s and it was a bit of a throwback even then. I think I might have a look myself in the hear future. hey John, I did visit Mackaris – it’s definitely alive and kicking! 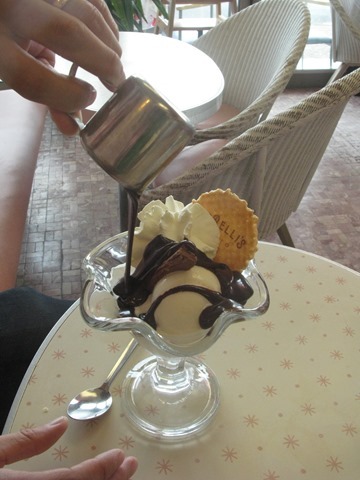 Sadly ran out of time (and tummy space) to try one of their sundaes, but had a snoop around. Looks like business is thriving. Great article. I hate to burst your bubble but my friend works for Chiappini’s and I know for certain that they don’t make their own ice cream. They did many years ago but now they buy it in ready-made from another company!